IX.5.14, 15 and 16 Pompeii. Combined plan. The room numbers are those referred to on the pompeiiinpictures pages for IX.5.14, IX.5.15 and IX.5.16. Room numbers a to u can be found on the pages for IX.5.14. Room h can be found on the page for IX.5.15. 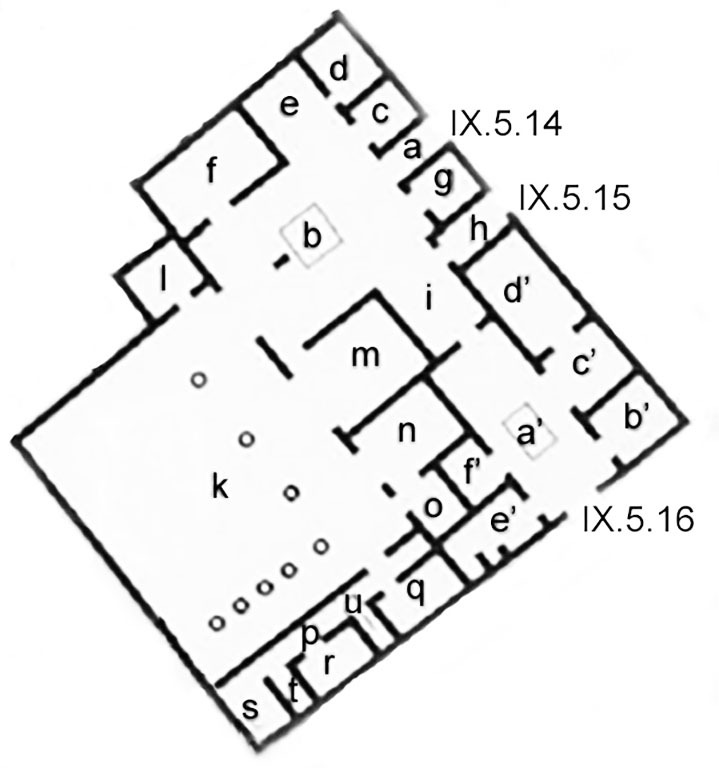 Rooms a’, b’, c’, d’, e’, f’, in the south-east corner, can be seen in IX.5.16. This plan is to help you accurately locate the rooms shown in the photographs of this house and to be able to refer back to PPM. This plan follows the room numbers used in PPM. See Carratelli, G. P., 1990-2003. Pompei: Pitture e Mosaici. Roma: Istituto della enciclopedia italiana, Vol. IX, p. 600.